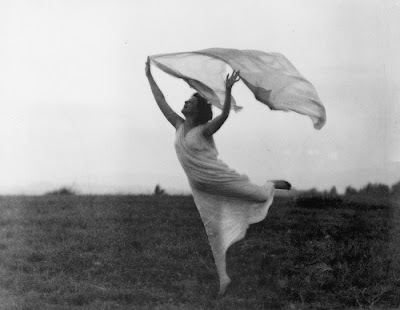 mundane jane: She might also have danced in a field with a mondo scarf. Nothing would surprise me. She might also have danced in a field with a mondo scarf. Nothing would surprise me. My friend Paulette had a birthday this weekend. She received wondrous and imaginative gifts, drank copious beverages of the alcoholic variety, and partied like 1999. She had everything a girl in the blush of youth could desire on her big day--except a haiku. Because I hadn't written it yet. I'm still waiting for the Haiku police to come and get me. They must be close, now. image, Mrs. Florence Fleming Noyes in a scarf dance, Library of Congress.